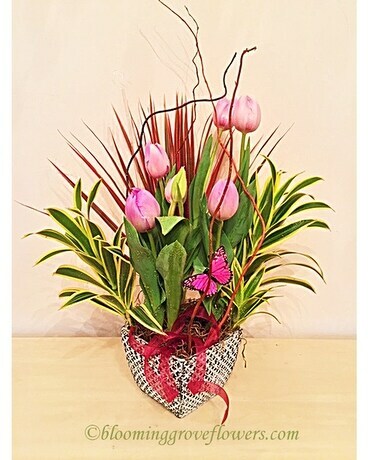 Seasonal potted tulips, decorated with cut greenery, willow branches, 'spanish' moss, butterfly and ribbon, in a matching container. Tulip color or/ and Container subject to change based on season and availability. However we will create something similar using products with an equivalent value: we will find substitution to assure the best quality and presentation for your special gift.